Whether you are attending a formal event or getting married, it’s important to know the difference and when it is appropriate to wear each style. The primary difference between a tuxedo vs a suit is mainly the presence of satin.Suits generally do not include any satin and usually have either plastic buttons or buttons faced with the same fabric as the coat. Suits are generally worn with a long tie, alone or with a matching vest. Tuxedos typically have satin facing on the lapels, buttons, pocket trim, and a satin side stripe down the leg of the pant.Tuxedos are commonly worn with a vest or cummerbund and bow ties.Of course, there are exceptions to every rule and it not to say that you can’t wear a bow tie with a suit or a long tie with a tuxedo etc. You definitely can, however, it’s generally the more common tradition. It is typically said that you never wear a tuxedo before 6 p.m., but the exception to that rule is wearing a tuxedo for your wedding or as a guest to a formal daytime wedding. Before planning to wear a tuxedo the formality of the wedding is key! If you’re planning to have a black-tie wedding, a tuxedo is a must for the groom. This sets the tone that this is a very formal wedding. Keep in mind you will likely have several guests arrive wearing tuxedos, and the last thing you want is for anyone to look more formal than the groom. The time-honoured tuxedo accessories include a cummerbund, waistcoat, suspenders and a bowtie. Nonetheless, times are changing and many men opt for less formal accessories. For example, wearing a tuxedo with a tie is becoming more popular depending on your personal style and how formal you want to look. When it comes to shirts and shoes; shirts for tuxedos are generally worn with white shirts that typically have a wing collar or a turndown collar. Regarding shoes, black patent shoes are the most acceptable shoe to wear with this formal attire. When it comes to the tuxedo suit price, it can range dramatically depending on the quality of the tuxedo. 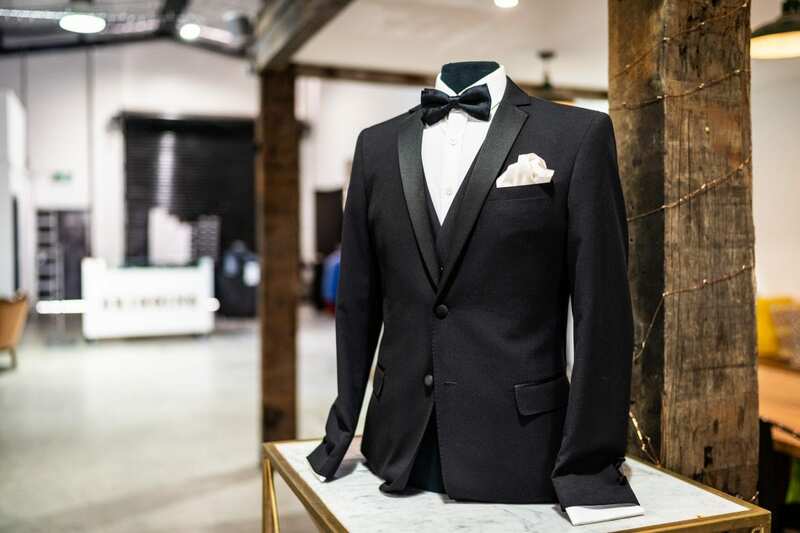 We, at Briggins, offer quality tuxedos in Melbourne and will walk you through the multiple options and tailor make a tuxedo to fit your style. There’s nothing quite like wearing a made-to-measure men’s suit to make you feel like a million dollars. A traditional suit is definitely more versatile. You can modify your suit to fit your personality and event. A suit jacket can be worn with dress pants, casual pants like Khakis, and even jeans. When it comes to shirts, shoes and accessories the options are endless even when it comes to if you don’t want to wear a tie, an open-collar look works well. There are no rules with men’s suits.So after you understand the difference it really then comes down to the message and impression you want to leave to those around you. A tuxedo gives you a distinguished look. When you wear a tuxedo vs a suit it’s to signify an important event. People wear suits every day to work, to the grocery store and no one will look twice. But a Tuxedo makes a statement!If you are looking to invest in a tuxedo or a men’s suit in Melbourne, We, at Briggins have a vision of convenience, quality and delivering a customer-focused experience. Come for a visit and you’ll see this vision brought to life as you immediately feel at home. This entry was posted in Blog and tagged Suits, Tuxedo, Tuxedo Melbourne, Wear Tuxedo.